“You hear so much in the news about this bad cop or that bad cop, but it wasn’t like that. 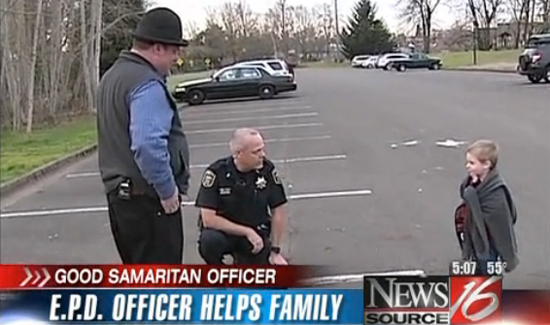 It was kindness and understanding.” – Homeless father Robert Wood, speaking about Eugene Police Lt. David Natt. Robert Wood had just returned to Oregon from Alaska with his two young sons, wife and baby-to-be. According to a report from KMTR News, they hadn’t found housing yet, so Wood said he was planning to sleep in the car with the family at Alton Baker Park to save money. That’s where a Eugene Police officer found the family. Since the park closes at 11 p.m., Wood said he wasn’t surprised when an officer came knocking on his window around 10:30. But he was surprised at the officer’s response. “He’s like, let me buy you a hotel room,” Wood said, who at the time had his 4-year-old son Samuel sleeping on his chest. Wood’s wife Heather, pregnant with their third child, had their 2-year-old son Logan sleeping on her. Eugene Police Lt. David Natt offered the Wood family two nights at the Campus Inn.